To put it lightly, Friday February 10 was a scorcher for Colorado! Let’s take a look at some of the notable weather today, the temperatures, wind and the weather pattern that helped push us into record setting territory. The National Weather Service office has been keeping tabs on temperatures today and posted this handy graphic detailing some of the temperatures recorded along the front rang today. The temperatures on the right are daily high records for February 10. This means that these are the warmest temperatures recorded on February 10 since record keeping began, and you can see things were quite toasty! The more notable numbers are on the left, these are all time monthly February high temperatures. Simply put, the old records in the columns on the left are the highest temperatures ever recorded in the month of February for those locations. Denver hit a high of 80 degrees today, easily surpassing the 77 degrees that was formerly the warmest temperature recorded EVER in February. As I’ve mentioned a few times, Castle Rock doesn’t have an “official” weather station for the NWS, they get the readings from Castle Rock at Centennial Airport. As most of us know, that’s not terribly accurate as there’s often a big difference between those two areas, luckily we got you covered! 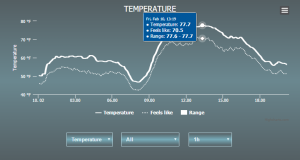 Feb 10 Low Temp for Castle Rock Colorado (so far…) Data from our weather station. 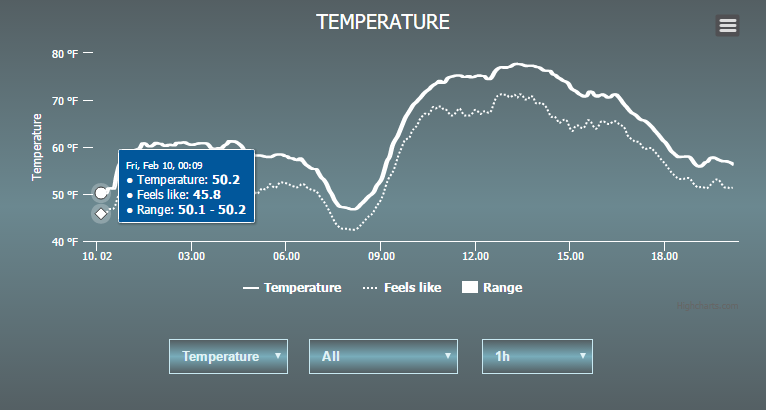 We knew it was going to be a toasty day when we reached our lowest temperature at just after midnight. We may see a lower temp before midnight tonight with cooler air moving in tonight but if not that will make for a pretty warm low temperature for February! To put this in perspective, Castle Rock’s average low for this time of year is about 17 degrees, so the low so far for February 10 is over 30 degrees above average! Feb 10 high Temp for Castle Rock Colorado. 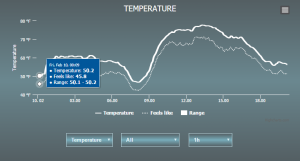 Data from our weather station. My station is not an official NWS reporting site so keep that in mind. So to recap the chart above, Castle Rock’s daily record high temperature was 68 degrees set back in 1996, today we broke that record by 11 degrees. That is a huge amount! The all time warmest temperature recorded EVER in February was 75 degrees, we broke that record by two degrees. I’m only going to touch on this because I consider Global Warming more of a political discussion than weather, and I’m no good at politics… just weather. I’ve had a few ask me today if weather like this is a definitive sign that global warming is real. The short answer is no, taking one day’s worth of weather and trying to attribute it to an overall weather pattern is short sighted and naive. That being said, any of you who have lived in Colorado as long as I have (or even longer) have no doubt noticed that we are seeing warmer temperatures earlier in the year and less snow overall. Whether this can be attributed to any long pattern and if humans are responsible is a discussion for another day. Suffice to say, the long term climate pattern does seem to be changing very slowly, I look at this from a purely scientific standpoint but one day of record temperatures (or even a string of them) is not enough to start attributing anything to a longer term climate change pattern.